Mixing is what we do, so it’s no surprise that we love the array of mixed drinks that come with the holiday season. 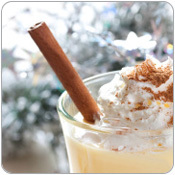 One favorite is eggnog, a drink that has several mixing steps. Making it can be tricky, so we thought we’d share our process for mastering a festive holiday eggnog. About Consuming Raw Eggs: To review health and safety guidelines related to the consumption of raw eggs, visit your government’s website: Health Canada and US FDA.